We found that between 2014 and 2016, states removed almost 16 million voters from the rolls, and every state in the country can and should do more to protect voters from improper purges… Almost 4 million more names were purged from the rolls between 2014 and 2016 than between 2006 and 2008… This growth in the number of removed voters represented an increase of 33 percent — far outstripping growth in both total registered voters (18 percent) and total population (6 percent). 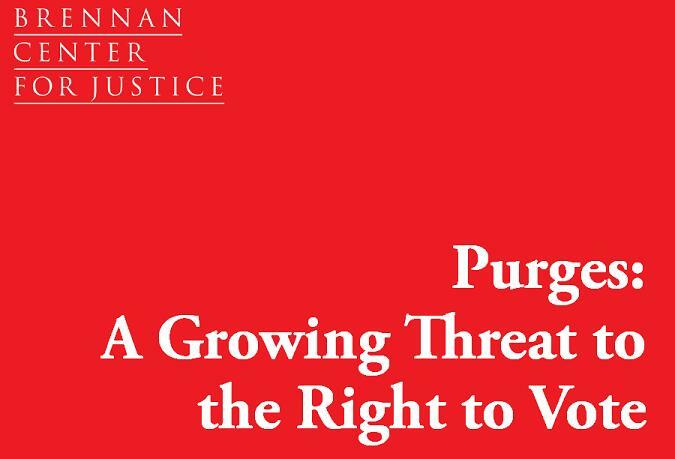 The Brennan Center report finds that voter purging increased markedly in states that were freed from the “preclearance” requirement of the 1965 Voting Rights Act after a 2013 opinion by a 5-4 Supreme Court overturned the rule. For 48 years, states with a history of discriminatory voter purges had to get “preclearance” from the Department of Justice before making changes. Since 2013, states can make any changes they want, and run them right through the election as they languish in court challenges. Larry Harmon voted in presidential elections. He voted in 2004 and 2008. In 2012, he was not happy with the candidates, so he refused to vote. Then, in 2015, he wanted to vote against a marijuana legalization initiative. Larry Harmon found out that he was no longer registered to vote. Larry Harmon skipped six years of elections. The State of Ohio sent him a “confirmation” postcard after two years. The card directed him to confirm his address by returning the card or voting within four years or lose his right to vote. Larry Harmon claims he did not receive the card. The card looks like junk mail and most people do not return it. In the United States, we have the right to vote or not to vote. Too many Americans skip too many elections. Many show up every four years for presidential elections. Under the voter purge system of Ohio, Larry Harmon showed up to vote after skipping just one presidential election only to find his right to vote stripped away. Larry Harmon contacted a voting rights group and sued for his right to vote. At the trial court, he lost. At the appeals court, he won. Then, the case arrived at the Supreme Court. 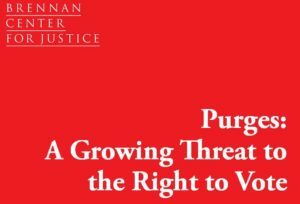 Last month, just before the report that 16 million people were purged came out, the Supreme Court decided in a 5-4 opinion that the National Voting Rights Act (NVRA) and the Help America Vote Act (HAVA) permit purging of people who skip elections then fail to return a “confirmation” card in the mail. Justice Samuel Alito writes the 5-4 Supreme Court opinion. Samuel Alito claims that “this case presents a question of statutory interpretation” which can be answered by the plain meaning of the language in the law, and that the four Justices who disagree with him merely have a “policy disagreement.” In other words, Samuel Alito’s interpretation is correct, and anyone who says otherwise is wrong — “no sensible person” would disagree with Samuel Alito’s correctness. In a 21-page opinion, Samuel Alito harps on every possible angle of interpretation of the law. But he makes one huge mistake right at the beginning that renders his entire analysis an absurdity: he literally quotes the law then changes the language before his arguments begin. He analyzes the language he imagines — not the language in the law. Subsection (c) suggests that a state “may” use “change-of-address information” from the postal service to “meet the requirement” of an indication that a voter actually moved before purging a voter. Subsection (d) provides the actual process of purging. A state must send a notice to the voter. If the voter does not return the notice and does not vote in the next two federal elections, the voter is purged. This method is called the “confirmation” procedure. It is clear from the bolded language above that a voter may not be purged unless and until conditions in both subsections (c) and (d) are met. The first is a prohibition that was included in the NVRA when it was originally enacted in 1993. It provides that a state program “shall not result in the removal of the name of any person . . . by reason of the person’s failure to vote.” Ibid. Samuel Alito suddenly twists ‘(c) and (d)’ to ‘either (c) or (d)’ — literally the single dumbest thing a lawyer could do to interpret language. The word “and” means all conditions must be met. The word “or” means only one condition must be met. Hence, Samuel Alito may now skip right past the subsection (c) requirement to get information from an outside source like the postal service, and jump right to subsection (d) to run the purge process all by itself. He concludes that the purge process may be run on everyone who skips elections. JUSTICE ALITO: It says — it says that — that it’s all right if you followed either (c) or (d). MR. SMITH: (c) and (d), Your Honor, with respect. JUSTICE ALITO: Well, it say s– you think you have to follow (c) and (d)? JUSTICE ALITO: That’s not what it says. Mr. Smith told Samuel Alito exactly what the law said — “and” not “or” — but Alito denied it and contorted it anyway. From this basic error, all of his further analysis — all 21 pages — fails. Samuel Alito writes the opinion, and a purely partisan 5-4 Court of Republicans sign on — Chief Justice John Roberts, Anthony Kennedy, Clarence Thomas, and Neil Gorsuch. They all sat there and heard the argument over whether the law required ‘(c) and (d)’ or ‘either (c) or (d),’ and somehow, they got it plainly wrong. This is called result-oriented analysis. The procedures described in subsections (c) and (d) consist of a two-step removal process in which at step 1, the State uses change-of-address information (which the State may obtain, for instance, from the Postal Service) to identify registrants whose addresses may have changed; and then at step 2, the State must use the mandatory “last chance” notice procedure described in subsection (d) to confirm the change of address… you cannot confirm that an event happened without already having some reason to believe at least that it might have happened. Subsection (c) says that “[a] State may meet” its obligation “to remove the names” of ineligible voters on change-of-residence grounds by sending notices to voters who are shown by the Postal Service information to have moved, but subsection (c) does not even hint that it imposes any sort of minimum reliability requirement for sending such notices. §§20507(a)(4), (c). By its terms, subsection (c) simply provides one way–the minimal way–in which a State “may meet the [NVRA’s] requirement[s]” for change-of-residence removals. §20507(c). As respondents agreed at argument, it is not the only way. Tr. of Oral Arg. 53. To Samuel Alito, the postal service information is “the minimal way” to detect voters who moved. Yet he permits the state to purge voters with precisely nothing but the prohibited factor, the “failure to vote.” Dear Justice Alito: “failure to vote” is less than the “minimal” postal service information AND “failure to vote.” Or to write a formula: F2V < USPS and F2V. The final Supreme Court decision came out with Samuel Alito and four Republicans on one side, and Stephen Breyer and three Democrats on the other — a perfect 5-4 partisan split. Additionally, Clarence Thomas wrote a solo concurrence where he questioned federal power to regulate state elections, and Sonia Sotomayor wrote a solo dissent describing the purposes of voting laws. Clarence Thomas writing for himself says the Court’s outcome is acceptable, but he would take the opinion further. The National Voting Rights Act (NVRA) “would seriously interfere with the States’ constitutional authority to set and enforce voter qualifications.” States have the “authority to verify” voter qualifications, not the federal government. To support this view, he quotes generously from his own prior writings. Clarence Thomas would disagree too if the case involved overruling a state supreme court, stopping a vote count and installing a candidate into the White House — as long as the candidate was one that he liked. That’s what he did in the 2000 case Bush v. Gore. The dissents have a policy disagreement, not just with Ohio, but with Congress. But this case presents a question of statutory interpretation, not a question of policy. That would be subsections (c) and (d) — not “either (c) or (d),” Justice Alito. This year who knows how many more than sixteen million voters will be purged. The number will be huge. Representative democracy hangs in the balance.